According to a recent Wall Street Journal article, “Amazon Can’t Dent iTunes,” when it comes to selling music. One of the key differences between the two music retailers is pricing. Amazon often employs steep discounts to draw consumers. For example, Amazon will sometimes price new front line albums $3.99. iTunes usually sells albums for $9.99 to $14.99 the article states. However, despite Amazon’s retail price, it normally pays the entire wholesale price to the supplier. Amazon’s also offers monthly promotions of up to 100 specially priced CDs at $5 each. This product, the article states is the result of a cooperative deal between record labels and distributors. Image source; WSJ. Click to read full article. 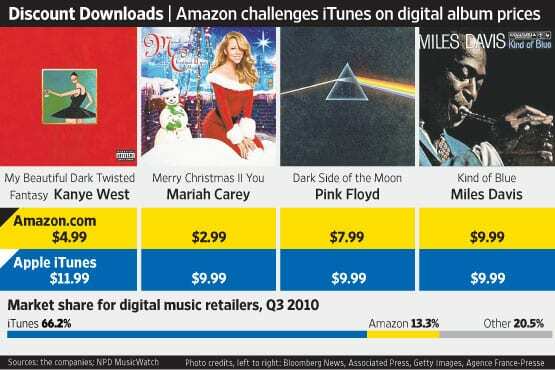 Wall Street Journal article, “Amazon Can’t Dent iTunes,” when it comes to selling music.